We have made some exciting upgrades to our product that will make it easier for you to get those referrals! We have added more flexibility when designing your Member page and made it easier to manage and communicate with your members and referrals. Take a look at our notes below to see how you can benefit from our new features! 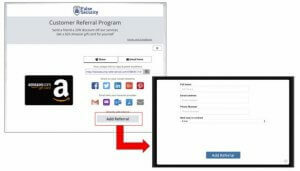 We have made it easier to grow your business through your Customer Referral Program by giving your members the ability to add referrals directly from their Member page. Including our new “Add Referral Directly” button to the member page will allow your members to directly input their friend’s information right into your account. 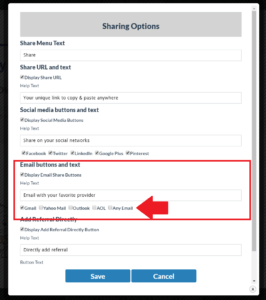 We have given you the power to pick and choose which email providers are included in your share options. If you are only interested in supporting Gmail, simply deselect the rest of the email providers under Sharing Options > Email buttons and text. We have also added the ability to custom format your Member to Referral email. 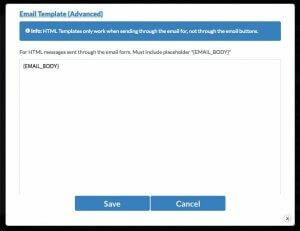 Using our Advanced HTML box, you can add your own code to personalize the email to be more eye-catching (and less like spam!). To access the Advanced HTML box, go to Email Form > Email Message on your Member page. We added more notifications to ensure your members are kept in the loop with their referrals. Now you can automatically send your members an email when their referral has been added, qualified, or approved. Enable or disable these emails as well as edit the text on our new Emails & Notifications page. We’ve created a new page for you to manage all your emails and notifications in one place. 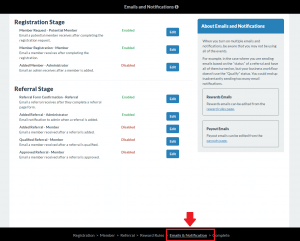 From this page, you can enable/disable a notification and edit the content, as well as access your Rewards and Payout emails. To access your Emails & Notification page, select the edit program button and select Emails & Notifications. And a couple smaller (but exciting!) changes…. As always, we are constantly optimizing our product to make creating and managing your program faster, easier, and more customizable. Take a look at some of our improvements below! Auto Login from Registration page: If you have enabled password protection and a member has already logged into the program, the next time they select the registration link they will be automatically logged into their member dashboard. Terms and Conditions Overhaul: Edit the text, rules, and appearance of your T&Cs by selecting the “Term” button on the Registration page. We also give you the opportunity to not display any Terms and Conditions. Option to remove the “Referral Link”: We’ve included the ability remove the option to automatically include a Referral Link at the bottom of your Member emails. Optional Phone Number Requirement: We’ve taken away the rule that makes phone numbers a required on your Registration page. Login/Reset Page Custom Text: Add a custom title and description to both the Login and Reset page to make each page match your branding. For more information on how to better customize your program visit our Knowledge Base. Read about our last product update or take it back old-school and read our very first product update. We really have come far. Cari Hochman is the Product Specialist at Referral Rock. She has a passion for making information accessible, an obsession for organization, and believes all spreadsheets are better when they are color coded.